The Terratorium of Lindinis is a carefully surveyed and planned land area corresponding to survey principles seen throughout Britannia. This is further illustrated by the Corinium Terratorium. The connecting factor is the design basis of the Foss Way, a precisely aligned Roman Road. “As the military tide swept north and west, the necessity of maintaining communications led to the construction of main roads. These were entirely different from the ridge ways used in the Iron Age: they were planned on the grand scale, they knew precisely where they were going and their effect was at one blow to make a unity out of several parts of Britain. Then the efficient use of the roads demanded staging camps and posting stations, some of which were planted close to the sites of forts and some not and so we have a string of settlements along them which are Roman, not native in origin. These, like the forts before them, also served as collecting stations for taxes in kind and many of them grew into small towns. Thus we must pause and reflect upon the basic premise behind each statement. The collective inference of the above extracts is that there was a great deal of surveying involved within the landscape of Britannia by the Roman Agrimensors. Roads cannot be aligned over large distances without a basic survey to establish the practicalities. Terratoriae cannot be established without the Agrimensorial work required to locate, mark and record boundaries. The centuriation of land for the colonists cannot take place without the Agrimensor first laying out the centurial grid upon the ground and enumerating the plots for the lottery distribution to take place. Thus, we may use the Roman roads and other boundaries to retro-survey an area and determine the original parameters. If the comment by Rackham had been from ‘Lindinis to Lindum’, a far more likely alpha and omega for the Foss Way alignment, with possibly a Colonia at each end of this alignment, it would have seemed more significant. However, analysis of this major highway provides adequate data to indicate that the base alignment is a straight line, inclined at a 3:5 Tan ratio to OS grid north. Here, at a basic OS350KM east, the deviation between grid north and geographical north is below ‘survey variation’ and tolerance. Thus the 3:5 tan ratio [30.96 degrees] can be considered a true reading to geographical north. A full explanation is given in Ferrar/Richardson, 2003. Therefore, along a deliberately aligned Roman Road we may expect to encounter Agrimensorial activity. From Lindinis, OS352.00E/122.45N we can calculate the 3:5 ratio alignment to Lindum, OS498.12E/365.98N, it is a very precise 192 Roman Miles or 400 Centuriae, with the easting and northing components of the angular alignment at 205.8 centuriae east and 343 centuriae north, as diagram Rm2D01 illustrates. Lincoln, Lindum is a rather extra-ordinary site, situated atop a scarp face above the River Witham, and as such from a military viewpoint not a site to be varied in location. Ilchester, Lindinis however, has a variable location; there are rivers and wetlands aplenty to afford choice. We must therefore conclude that such a precise distance was achieved by surveying from Lindum southwards, rather than the alternate. Thus we may analyse the route of the Foss Way as it approaches Lindinis from the north. From the local routing Radstock to Ilchester, the survey detail becomes so very apparent. Through Stretton on the Fosse, the road has a natural tangent angle 7:16 ratio to its junction on Beacon Hill with the Roman Road from Old Sarum to the Mendip Hills [Charterhouse]; this road being referenced by Margary 45B. The next Foss Way alignment to Pye Hill, 7:26 tan ratio, has an even greater imperative for its raison d’etre, Beacon Hill. At Beacon Hill, OD288m the natural levels allow a view to Pye Hill, OD143m and thence to Summer House Hill, Yeovil, OD107m. 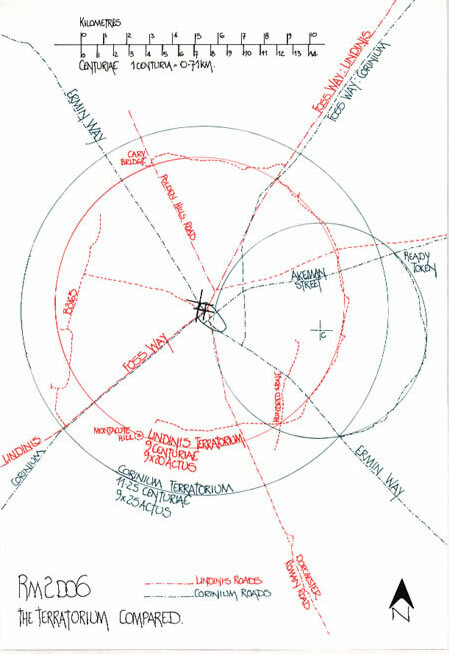 The alignment from Beacon Hill to Pye Hill is a direct visual survey line to Summer House Hill. But, at Pye Hill the deviation in the Foss Way toute, to cross the contours from OD143m to OD50m at Wraxall, requires new sub-alignments to Lindinis/Ilchester. The first sub section is a 7:11 tan ratio until the Foss Way reaches the flood plain of the River Cary, Cary Fitzpaine. Thence the alignment is dictated by the view from Montacute Hill; it is a precise alignment to the summit. It should be borne in mind that Montacute Hill is itself a contender for the major survey point at the southern end of the Foss way. Here we see the art of the Roman Agrimensor and the preparatory work required to formulate a survey alignment. From the first visual alignment and its viewpoint, Summer House Hill OD107m, a right angle, 90 degrees, is surveyed, and this directly aligns to Montacute Hill at a distance of 10 centuriae. Thus by utilizing the natural high points which have a known and even fortuitous distance apart, the Roman Agrimensors established the alignment for this section of the Foss Way. “There are thus some grounds here for thinking that the ‘Durotriges’ had a vested interest from the beginning in the site selected for the town; indeed, the very particular character of the site may have played a part in the coining of their Roman name, Lendinienses; for ‘lake’ perhaps read ‘ox-bow lake’ for the Roman town would have been entirely surrounded by water”. Thus did Katherine Barker in the 1985/86 paper ‘Pen, Ilchester and Yeovil’, [SANHS vol130] describe the landscape of Lindinis. However, quite correctly there was no immediate link made between a possible ‘oppidum’ south-west of Lindinis, and the fact that ‘Rome’ supplanted an original fort with the town and its Terratorium to counter the ‘oppidum’. The argument put forward that Roman Civitates or similar were sited to supplant ‘oppida’ and not constructed to suit ‘Roman’ needs has been shown to be a false premise. Given the great number of ‘oppida’, large, medium and small situated throughout pre-Roman Britain, it is inevitable that a number will be supplanted by Civitates. The logic of surveying, aligning roads, placing forts and towns to suit landscape spatial requirements was not a priority in Iron Age Britain. Regimentation, laws, order, exactness and the necessity to tax every conceivable item for the continuance of ‘Rome’, arrived in AD43. Thus it is possible to demonstrate that the Roman landscape of Britannia is surveyed and planned. The description of the development of Lindinis from a road station, Fort, settlement, then town, to a Terratorium is not the function of this paper. The creation of the Terratorium by survey means however, is. At this point it is necessary to state that those dimensions given are the radii of Cirencester and Ilchester. But, the comparison has been made and the surprising similarity indicated within that paper, between the two eastern boundaries must be investigated when the Lindinis Terratorium is confirmed. An arc, part of a circle, can have its centre established by simple geometric analysis, be it on a map or in the actual landscape. The eastern boundary of the putative Lindinis Terratorium from the Foss Way in the north, to the Hundred Stone in the south-east fits to a 9 centuriae radius whose centre is to the west of the southern town, close by the River Yeo. A circle drawn upon the OS map, radius 9 centuriae or 6.39KM [3.97075 miles], fully encompasses the Terratorium. More importantly, it also locates the Foss Way survey point of Montacute Hill, as the diagram illustrates. From this circle we can extrapolate dimensions; Foss Way at Stoke sub Hamden to Roman Road [Margary 47] for Dorchester, precisely 9 centuriae; the same Foss Way point north-westerly to the River Yeo junction is marginally more than 9 centuriae, at 9.3C. Thence from this point to the Polden Hills Road [Margary 51] is 8 centuriae, and onwards to the Foss Way at Babcary is 7.75 centuriae; continuing on, it is 10 centuriae south-easterly to the Portway Farm Track, which is in turn 9 centuriae from the putative Terratorium boundary at the Dorchester Road junction and hence we are back to the 9 centuriae distance to Stoke sub Hamden and the Foss Way. Thus the Foss Way appears to control the landscape profile of the Terratorium. The western boundary, from South Hill, Somerton, is basically the B3165 to Martock and this road alignment has the same angular bearing to OS grid north as the Foss Way projected alignment from Pye Hill to Summer House Hill, Yeovil. If we extend the base line from Summer House Hill over Montacute Hill at 10 centuriae distance, and then across Ringwall Hill at 15 centuriae distance, the line terminates at precisely 16 centuriae just north of Cripple Hill. The parallel to the Pye Hill line, the B3165, commences from this point via small roads, tracks and footpaths before it is the actual B3165 road over Load Bridge. The road from Little Load to Pill Bridge, the perpendicular at this point, is in fact a reasonable contender for the circles quadrant line. But, more importantly, the mid-point of the 16 centuriae southern survey line over Montacute Hill, when projected as a northerly perpendicular, produces the precise point where the Foss Way crosses the River Yeo in Ilchester/Lindinis, and of course that bridge aligns through the actual circle centre and virtually across Pill Bridge. To continue the western boundary, the B3165 extension we must project the line for a total of 18 centuriae, the circles diameter. This then gives us the node point for the northern boundary over Windmill Hill, across the Foss Way to the junction with the first line from Pye Hill. They meet marginally north of Forty Acres Farm with its local road paralleling the putative northern boundary. 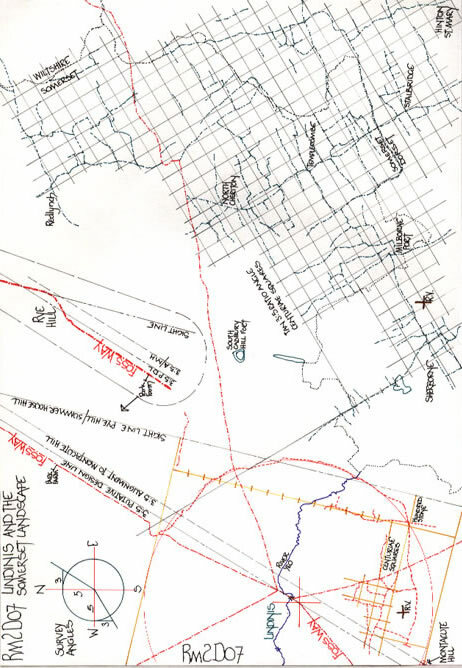 Thus there is a survey alignment for each of the Terratorium boundaries. The Roman Agrimensors, good as they were at surveying, are only so good. Using a line and posts plus a Groma there is only a certain level of surveying accuracy possible over a distance of c28 centuriae, the semi circle of the eastern boundary. It was in all probability set out from a straight chord line using similar angles to mark points on the circumference. The centre point would not have been utilised, the radius of 9 centuriae or 6.39KM precludes that. But why plot a circular boundary line at all? The answer to that question will probably remain a mystery [as will the reason at Corinium], and as the Romans tended to build in straight lines it is all the more fascinating. If we look at the opposing landscape with South Cadbury Fort to the east, and Corton Ridge at OD130m, Sandford Orcas with Holway Hill OD170m and then Ambrose Hill, Charlock Hill and finally the hills of Nether and Over Compton between Sherborne and Yeovil, we see an array of heights which no doubt from a military viewpoint would be seen as threatening. This is not the case at Corinium. Thus the circular boundary perhaps faces the landscape of most danger, where-as the straighter western boundary is protected by the Somerset Levels. But the southern boundary which is also overlooked from the survey line heights has a curved format also. However,there is possibly no explanation available! 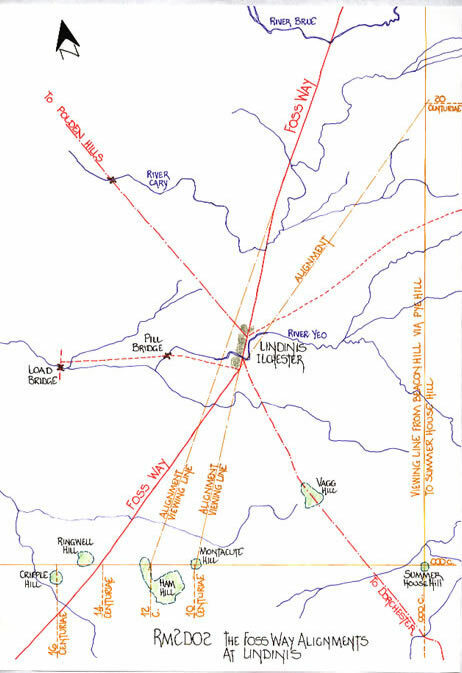 It has been shown that the original alignment of the Foss Way and its survey data are the basis for the boundaries which became the Terratorium of Lindinis. The simplicity of the survey data has been evaluated from within the landscape surrounding Lindinis, and indicates that the Roman Agrimensor had a practical knowledge and skill which can be shown to have been utilized throughout Britannia. The alignment of the Foss Way as it approaches Corinium from the south west is quite straight forward. As it passes Tetbury, [there is an approach road perpendicular to the Foss Way, which is precisely 5 centuriae in length to a parallel central road], it has a local angular bearing to NSEW of Tan 3:4 ratio and at Jackaments Bottom it turns to a Tan 5:6 ratio. This appears to be the same ratio as the Foss Way south from Lindinis. Here, OS grids north and geographic north are coincident, precisely at OS400KM east. The peculiar routing around Corinium can be accepted with the reasoning that there is the distinct possibility that the Foss Way from Jackaments Bottom is directly aligned to its northern part as it passes south of Chedworth and Stowell. 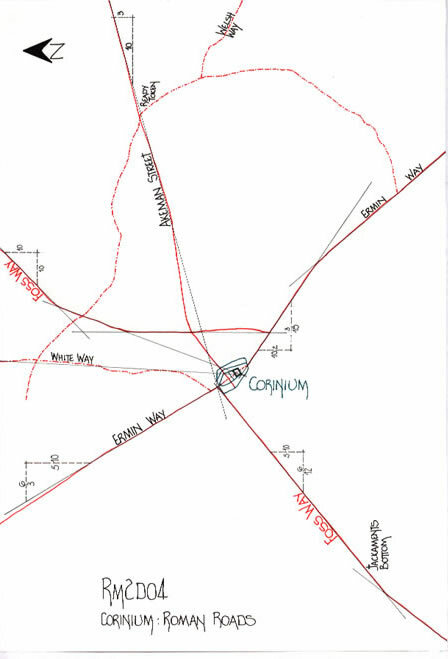 However , the deviation is so deliberate, first utilizing part of the AKEMAN STREET route and then forming an eastern bypass to Corinium, that the north-south section of road must be considered important in its own right. Thus we may begin to look for survey markers of deliberate actions in the landscape. The first noted was that from Corinium Fort to the northern bend on the Foss Way bypass was 100 Actus, 5 Centuriae, when measured along the projected alignment, with the ‘western’ side of the fort probably 2 Centuriae from the bypass. The White Way is also aligned to the Fort, even though it is considered as joining the northern Ermin Way north of the Civitas north gate. This 100 Actus unit was then used as a basic measure and plotted upon all scales of O S map available as a grid square [ 3.55KM] . This exercise produced no real surprises, but, clearly indicated a large number of parallel roads and field boundaries that have rational Acti measures. The next task was to plot the design line for Akeman Street, a Tan 3:10 ratio. This plotted line coincides exactly with the projected lines for a FOSS/ERMIN junction north of the Fort. This is a natural survey point and using the same 100 Actus dimension a second grid was set out using the Tan 3:10 Akeman Street line. This new angular grid proved most enlightening, with a parallel road to Akeman Street revealed. Commencing at Broad Blunsdon, to the south of Corinium on Ermin Way, it traverses eastwards to Faringdon in Oxfordshire. But more importantly the plot indicates that Highworth Road and Town Centre are 400 Actus south and 400 Actus east of the survey point being postulated. [400 Actus is 20 centuriae]. Remaining with road alignments, [prior to looking at field and boundary plots,] an intriguing curved road from ‘Ready Token’ on Akeman Street to Westfield Farm on the southern Ermin Way appeared to be another bypass road. A short section comprises the Welsh Way before it traverses a southerly and south westerly quadrant, passing through Sunhill, Meysey Hampton & Down Ampney. Curious as to the historical significance of such a curve, the arc chord was drawn and its angular Tangent alignment verified. It is precisely Tan 3:10 and as such the same mathematical alignment in survey terms as Akeman Street. That is to say, instead of Tan 3:10 north of east it is tan 3:10 west of south. Could this road be a Terratorium boundary? It is a very simple geometric exercise to find a curves centre point, even though it may never have been physically used upon the ground to form the curve. The radius, with the curve known, can be constructed from the chord length. The radius was calculated as c16000 Pedes or c133.333 Actus. 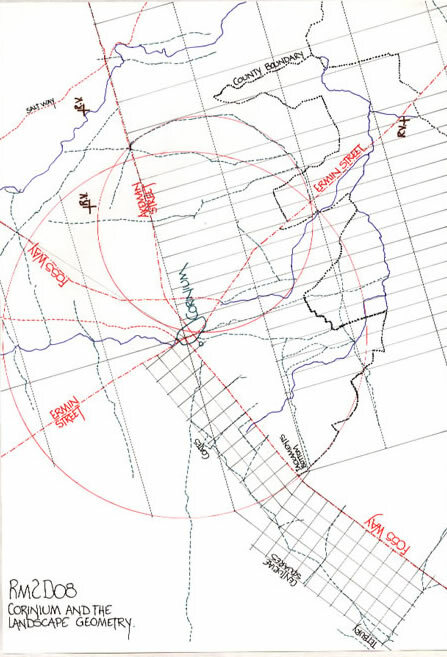 Using the calculated centre point, and the O S map, a circle was drawn and the profile of the road found to match the circumference of the circle, as was perhaps expected. Unfortunately the angle subtended by the chord is 125 degrees and not the classic 120 degrees of an isosceles triangle in a circle. But, more importantly , this geometric curve encompasses quite accurately the Fort at Corinium, as if its western boundary was a survey point itself A north-south route , Ermin Way is not doubted, but, an east west route alludes us. 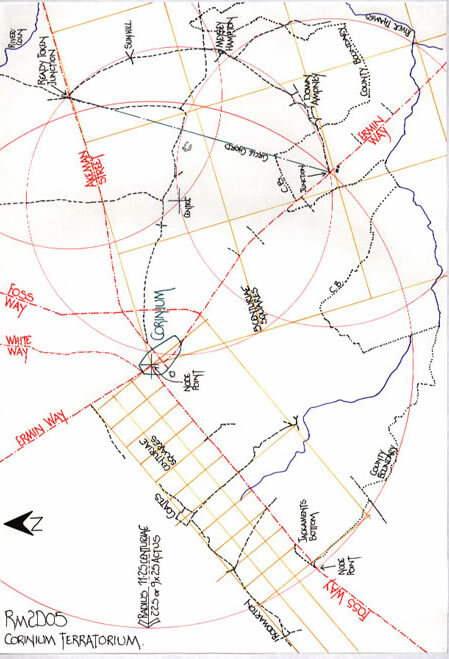 And, when a diagonal to the 100 actus square based upon the Foss way eastern bypass line is drawn, it passes directly through Ready Token & the putative circles centre. It is therefore necessary to find a ‘raison d’etre’ for these phenomena, of possible Roman origin. One method is to use the compass set at 16000 Pedes radius, 6.6666 Centuriae or 4.7333 KM and form new circles using the chord termini, Ready Token and Westfield farm as centre points to find other equal-distances. This is pure geometry used to retro-survey an area in the simplest manner, and has no other significance. However, because the chord is not the sixth part of a circle, i.e. sub-tending 120 degrees, then, any new circle will not pass through the original centre and the circumference point. The road from Ready Token on Akeman Street, through Sunhill, Meysey Hampton and Down Ampney to Ermin Way has the most remarkable surveying credentials of any road in the area. Again we must ask, is the eastern road the boundary of the Terratorium? If Lindinis is an example of local Terratorium practices, with the same methodology applied along the Foss way, then perhaps the Foss Way can indicate a raison d’etre for the putative Terratorium boundary at Corinium. The Foss Way has been shown to have a design alignment of tan ratio 3:5, but, the individual road sections, node point to node point vary quite considerably from the desire line. The Foss way, just south-west of Lindinis has an angular alignment, from Dinnington to Lindinis of Tan 4:5 ratio [c38.66 degrees]; where-as the approach road to Corinium is more fairly described by a Tan 5:6 ratio [c39.8 degrees]. It will be very apparent that the difference is marginal, and, is in fact below survey tolerance measure. That marginal difference in decimal terms is 0.8 to 0.833, so very little! But, being the same Roman Road, no doubt the surveyors endeavored to achieve the same desire line, and therefore we can reasonably assume they were designed to match. But, the other roads also exhibit similarities of design, in that Ermin Way north from Corinium parallels the Polden Hills Road north from Lindinis; and Akeman Street east from Corinium parallels the Lindinis easterly route to Sparkford/South Cadbury. The two south-easterly roads are reciprocal alignments. The two circles encompassing the Terratoriae are perhaps examples of the two forms of centurial measure. Lindinis has a radius of 9 centuriae, which is 9 x 20 Actus. Corinium has a radius of 11.25 centuriae, which is 9 x 25 Actus, and as such it could merely be the larger centurial measure found within the Roman Empire. We must consider the time-scale of the two sites and the fact that there were possibly teams of Agrimensors employed upon the Foss Way and its Civitates who were schooled in the differing and obviously varying disciplines taught in the ‘Schools’ taught. Thus the variation is fact. The Lindinis Terratorium appears to have a simple base design, the circle, which would encompass 180 x 180 x 25/8 Actus Quadrati or 101250 A.Q. This could also be considered the squaring of the circle in that a 16 centuriae or 320 Actus square is 102400A.Q. [16 x 16 =256 and the circle is 253.125 Centuriae] But appendices 3 and 4 should be studied for the overall picture. With the shape of the Corinium Terratorium, we must consider if it is in fact based upon a smaller unit when the Fort was extant, prior to the Civitas being established, and then expanded to a full Terratorium [Glevum, the Legionary Fortress and its Terratorium is merely 25 KM to the north-west]. 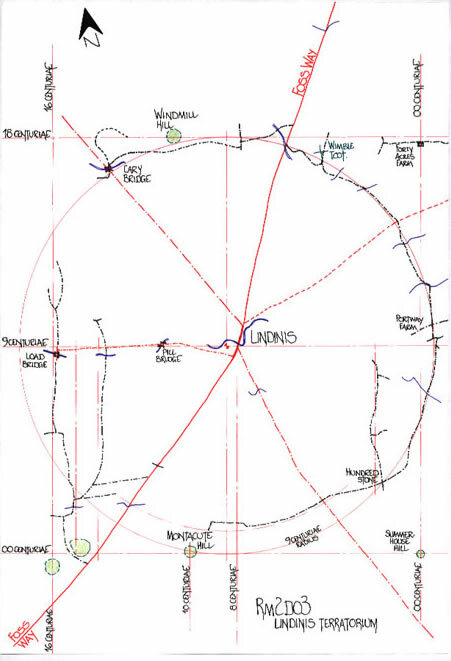 The circle formed by the curved eastern road has a c16000 Pedes radius and encompasses the Corinium Fort Site. Thus at 133.333 Actus radius, the land incorporated would have been 55555 A.Q., or 138.89 centuriae. The putative 11.25 centuriae circle encompasses 158203 A.Q. or 395.5 centuriae. The temptation is now to see Lindinis as a 256 Centuriae Terratorium and Corinium as a 400 Centuriae Terratorium. Both are of course simple mathematical squares, 16 x 16= 256 and 20 x 20= 400. That is of course speculation, but obviously the Agrimensors did have an area of land, either dictated to them or determined by the numbers of people or veterans requiring a land allotment. Lindinis and the Somerset Landscape. Corinium and the Landscape Geometry. The Terratorium of Lindinis has been laid out using the surveying skills of the Agrimensor from the original survey markers utilized to align the Foss way. The right angle formed by the putative survey lines, Pye Hill to Summer house hill and thence to Montacute Hill westwards, is the most simplest of survey tools. Within the Terratorium there is landscape evidence of centurial alignments which can be seen further east again aligning to a Tan 3:5 ratio alignment. The land within the Terratorium was a mixture of arable, grazing and wetland. The necessity for a thriving town to expand may account for the move eastwards with better land. The Terratorium of Corinium, although similar in initial design, is actually far more complex in totality. The fact that two major roads, Foss Way and Ermin Way cross at this point, and it is the commencement of Akeman Street, predicates a far more complex history. There are several centurial layouts which are based upon the Roman Road profiles as diagram Rm2D08 illustrates. The circle enclosing the Terratorium appears to control the whole geometry, as at Lindinis. Illustrated by Diagram Rm2D09 is just how much influence the route of a Roman Road actually had on the adjoining landscape. The Foss way, with its design alignment across the landscape of Britannia certainly connects Lindinis and Corinium in more ways than previously imagined. 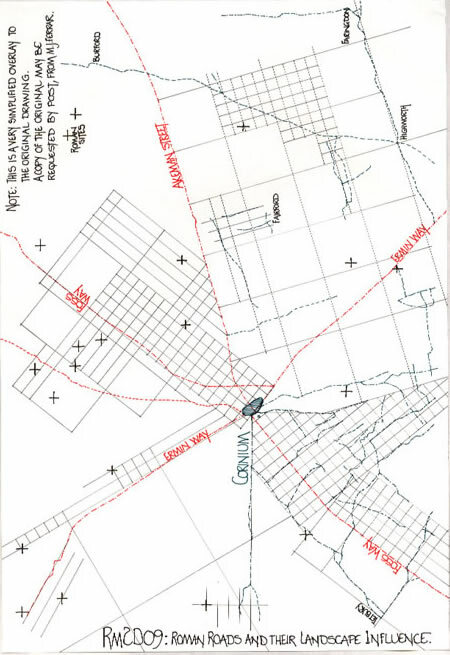 Extract from “Land Surveying” by Ramsay J P Wilson, M & E Handbooks; 1971. Page 22. The method of making a direct measurement depends largely on the accuracy required. It is a waste of time and money to take very accurate measurements when only a low accuracy is required. Conversely, it is useless to try and achieve high accuracy with a chain or plastic tape. Thus we must be very careful not to ascribe to the Roman Surveyors a level of accuracy that is not achievable. We constantly read comments regarding how accurate the Romans were. In fact, unless we know the precise survey markers that were used, we just do not know what accuracy was achieved. We must not compare the Centuriation of land, where the subdivision was the ACTI of 120 pedes, with a distance of even a Roman Mile of 5000 pedes. In the Roman mile there are just less than 42 Actus and the proportionate error is just the same. We can estimate the level of accuracy vis a vis the Antonine Itinerary, Mile Posts etc., but, they all indicate deficiencies in the measurements, which vary quite considerably. Thus we must apply common sense to the landscape dimensions we now find, apply survey error factors and above all note that repetitive dimensions would not have been built as the nearly correct whole Roman Mile units we calculate from the O S co-ordinates. They would have been whole units. 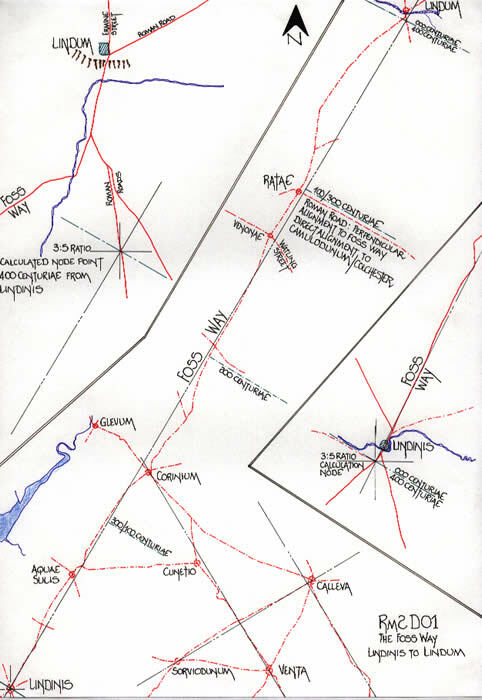 We should also note that a grid plan , a piece of graph paper on the landscape is a traditional method of planning for Greek and Roman Surveyors, and like a piece of graph paper we may use the lines, the interstices or spaces , or all three to create the pattern we desire. a) given a circles radius, PI could alternate between the 25/8 and 22/7 ratios. 63 Roman Mile radius, PI 22/7, circumference 396 Roman Miles. b) the irrational numbers PI, root2 and root3 all require fractional units to describe them in order that a resolution to standard triangular survey problems could be achieved. PI = 3.141592654 etc etc., and 22/7 = 3.142857143 etc etc.,; quite good accuracy, even for our age. From diagram Rm2D03 it can be seen that Lindinis Terratorium is probably delimited by a curved eastern boundary and a straight western boundary. Being formed as a half square, half circle. The enclosed land area is thus the same as the pseudo Pythagorean triangle used in the surveys. It is made up from the basic measures of Roman surveying, the 120 Pes Actus. Thus the easiest survey triangle to use is 120 x 120 with a 170 hypotenuse. Diagram 9 illustrates the possible geometry and mathematics of the 11.25 Centuriae circle which is the basic Terratorium of Corinium. The landscape to the south and east of Corinium is controlled by the alignment of Akeman Street and the 5 centuriae squares appear to be controlled from the 11.25 Centuriae Terratorium circle. Barker Katherine, ‘Pen, Ilchester and Yeovil’; SANHS, 1985/6, vol130, pp 11-45. Dunning R W, ‘Ilchester: a study in continuity’: SANHS, 1975, vol 119, pp45-50. Gardner E C, ‘Roman Road, Larkhill Quarry, Preston Plucknett’; SDNQ, 1909, vol XI. Dilke O A W, ‘The Roman Land Surveyors’, 1971, David and Charles, Newton Abbot. Ferrar M J and Richardson A, ‘The Roman Survey of Britain’, B A R 359, 2003. This thesis includes the many maps and diagrams now deposited at the National Monuments Record of English Heritage, Swindon. The thesis contains 86 bibliographic references, appendices and general notes. M J Ferrar 1992 and 2004. All diagrams are freehand layouts by the author.